The Gainesville Hawthorne State Trail winds 16 miles starting at Boulware Springs Park through the Paynes Prairie Preserve State Park and the Lochloosa Wildlife Management Area. We have enjoyed this trail in the past, and now it's time to introduce this trail to our youngest little one. The asphalt surfaced trail has hills and valleys , twists and turns, with beautiful scenic lookouts over Paynes Prarie Preserve and Lochloosa. This popular trail's head starts at the Boulware Springs Park, which is a nice picnic area with an old mill there converted to a restroom facility. The Boulaware Springs feed into the mills creek and fish are fun to watch swimming around the water plants there. The trail itself has some restroom stops, and drinking fountains, which is such a nice feature. We also saw many dragonflies, butterflies, a snake, and even a small gopher tortoise. 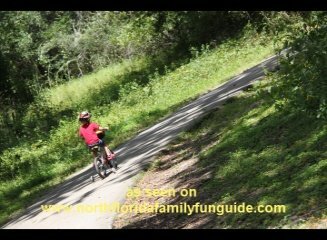 The hills make this trail a bit of a challenge for the little ones, but for the older kids, this trail is a real treat! There is even an equestrian accommodations, so you can bring your horse on the trail!